Uglyworld #798 - The Devils Punch Bowl, originally uploaded by www.bazpics.com. Finally it was time to meet the devil for Ice-Bat, so much so that the little guy was really afraid and chose to hide behind poles most of the time. "If you see's him, tells me ok", he said to me. I tried to explain to him for almost 20 minutes that there was no real "devil" here, and that it was only the name which had been given to the huge cauldron in the rock. 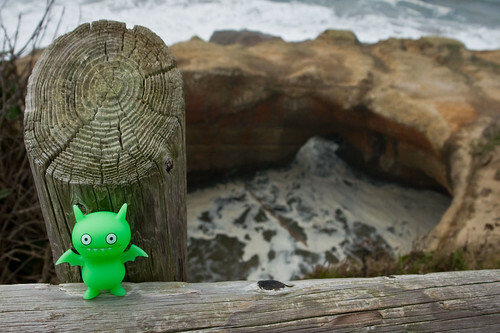 Eventually Icy overcame his fear and stood watching over the Devils Punchbowl as the tide through huge waves in through the gap in the cliff face and sometimes up and over the cliff itself.